3D-printed parts intended for practical use need to be designed for both the application and the printing process you’re using. 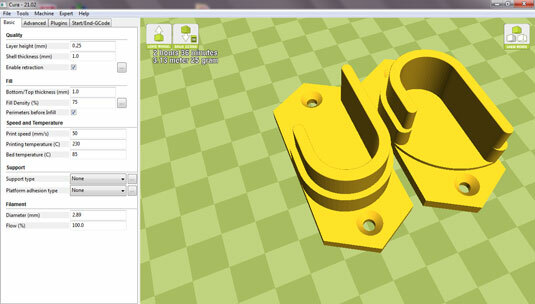 Here, you look at the design aspects and print settings of an example spool mounting bracket. You also look at what materials are appropriate to use for this bracket and similar objects. As you design a part, include the suggested material type, color, infill level, orientation, and finishing method in the 3D design file so that the machine can read these criteria and advise the user what material to load. Better still is when the printer can automatically fill in settings for processing to ensure a strong or correctly orientated part for manufacture. The adoption and use of new additive manufacturing types like AMF (additive manufacturing format) will allow all these things, including multiple part and multiple materials, the color of object parts, and density of fill levels, to be defined. AMF is not in common use for desktop 3D printers. At this point only a few industrial machines are using the AMF format, but that is likely to change as more emphasis is required on the design to 3D printing process for even desktop machines. Plastic materials used in 3D printing can range from very hard and brittle to incredibly elastic, soft, and stretchy. The material you use depends on the purpose of the item you’re printing. The more you understand about the properties of various filament materials — both straight off the roll and as used in simple test objects — the more successful your printing experiences will be. Bending and snapping a length of filament can tell you a lot about how the material will react to impact and load or stress. Sometimes, destroying printed parts helps you understand more about the limits of a particular material. Adding layer upon layer of semimolten plastic can create a weak point, and if the extruding temperatures of your hot-end were too low for a material, you may get poor layer bonding strength, but you can’t always know until you’ve experienced those situations. Experimentation and research are necessary before you try to produce a usable item. Printing single-walled objects such as tubes and cylinders along with fully filled 100% solid plates can help you gauge how strong a material will be after 3D printing. You may need to crush, twist, or drop a part to find out some of the material’s properties, such as layer adhesion strength. Safety first! If you’ve ever snapped a single strand of round spaghetti, you’ve noticed that almost every time, a small section breaks off and flies across the room. The same can be true of filaments or 3D-printed parts. Be very careful when removing parts from your build platform. If you decide to do some strength testing of various plastic filaments or destruction testing of any printed parts, take care. Always wear safety glasses and gloves for protection. Polylactic acid (PLA): This material is routinely used to print functional parts of 3D-printer kits. It’s rigid, has good layer bonding, and is ideal for printing parts larger than 100mm because it has a low tendency to warp or deform during printing. PLA, however, isn’t as impact-resistant as some other plastic materials and can crack under excessive loads or knocks. Also, due to its low-temperature glass transition point (around 55 degrees C), it can creep (slightly deform) over time, especially when a fastener, like a screw or bolt, is used to compress or pull on the printed layers of a PLA object. Acrylonitrile butadiene styrene (ABS): This material is another common choice for functional parts, but it’s tricky to print with because you need a heated build platform capable of running at least 110 degrees C, as well as a hot-end configured for ABS. Usually, you need to disable the part-cooling fan to help limit warping in the ABS plastic as it builds layer on layer. The example bracket is small, so it’s suitable for ABS printing, and Richard could have selected ABS for printing this part. Sometimes, the layer bonding strength of ABS isn’t as good as that of PLA, so the better choice was polyester. The co-polyesters PETG, PETT, and PET are ideal for this functional spool bracket. Their glass transition temperature is around 85 degrees C, which is slightly lower than that of ABS and higher temperature than that of PLA. Polyester materials are very good at layer bonding, which results in parts that are less likely to delaminate than ABS when they’re used or put under stress. Finally, these plastics don’t creep like PLA and have a good level of impact resistance for general use and accidental abuse. Another material that would be suitable is nylon (polyamide, which shares many of the properties Richard was looking for). The main down side to everyday printing with nylon it that it absorbs moisture from the air when just sitting around, so you need to dry most nylon materials before printing with them. (You have to do this every time you leave the spool out in the open for more than a few hours.) Nylon also resists many finishing techniques, resists many chemicals, and doesn’t sand, file, or polish. Otherwise, nylon is a fantastic 3D-printing material. Not many other home 3D-printing materials can beat its strength and durability. Nylon just takes some experience and patience to use. Often, a 3D model has an orientation that’s friendly to the 3D-printing process and allows material to be added layer on layer with minimal overhangs. But this natural orientation — often with a flat surface facing down and features sticking up vertically — isn’t always the best for strength when the part is in use. When Richard designed this simple spool holder, he was thinking of exactly this problem, so the U-shape holder has more material and is wider at the base, resulting in more bonding strength between vertically oriented plastic layers. The figure shows the sliced G-code layers of the spool mounting bracket in Simplify3D. You can use this visualization to check that the tool-path is likely to print the model as expected and also to review the orientation of features on the model before printing. The model has been placed onto the print bed so the layered build process can print the model without the use of any support material or plastic overhangs. A weak part of the model is where the top of the flat section ends and the bracket starts to print on top of the flat printed layer. This upper printed section has only a small area to bond with the lower plastic layer, so the design uses a wider section to provide more bonding contact. This stops the weaker layer from becoming detached when the part is in use. After the first step is printed you have gained strength in the vulnerable section, so you can reduce the wall thickness of the uppermost layers. Sliced G-code showing how each layer bonds to the one before it. If this part had been designed with a plate to screw to the wall and a thin U-shape protrusion to hold the wooden dowel, the U shape would be likely to snap off the base soon after entering use or after being knocked once too often. The part could have been designed to be printed in the 90-degree rotation, so the many printed layers would be aligned across the span of the U-shape holder. (Imagine these parts had been printed at a 90-degree rotation to the build platform.) This alignment would make the part significantly stronger due to the fact that each layer of plastic projecting out from the bracket if now in-line with the wooden dowel, so weight of the dowel and its contents does not put pressure onto single layers but a combination of layers at right-angles to the weight. But the layers would now also be aligned across the base rather than on top of one another. This means that when you use a screw to secure the bracket to the wall the screw will force the printed layers apart rather than compress them together. Forcing them apart causes a split and weakens the bracket. As soon as any weight is added, that crack will cause the wall mount to fail. The original orientation compresses the many solid layers when the screw is inserted, which is preferable. This consideration is important, as you don’t want the screw mount to be a point of failure when it’s loaded with heavy spools. The key settings are shown here in Cura. Most slicing programs allow a wide range of ways to print a 3D model, but correct orientation on the build platform is often the most important aspect. The height of each printed layer determines the appearance of the finished object and contributes some of the strength of the printed part. The relationship of the layer height range you can use with a certain nozzle size is directly related to the width of the printed line of plastic and the bonding strength (surface area) of each line on top of the previous layer. If you need functional parts to be strong but don’t want to wait an extremely long time for them to print, a layer height that’s 50 percent of the nozzle size is both strong and quick to print. The printer Richard used had a 0.5mm nozzle fitted, so he used 0.25mm layer heights. The part didn’t need a super-high-quality finish; it just needed to be strong and solid. 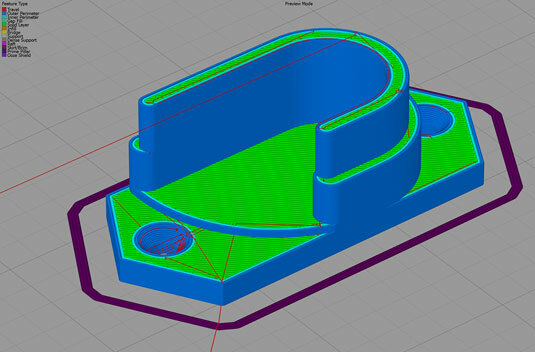 Cura: With Cura, you decide on a wall thickness, which is usually a multiple of the nozzle size. For the example part, you’d select 0.5mm for a single perimeter or 1.0mm for two perimeters. Perimeter outlines add strength to a model because they’re always printed together, which creates a solid outer and inner wall of plastic regardless of whether the infill level inside the printed part is important for strength. For some parts, a thick perimeter and low level of infill is stronger than a single perimeter and a higher level of infill. Most newcomers to 3D printing expect finished objects to be solid, and they’re often quite surprised to find that objects are almost always filled with mostly air (typically, 25 percent — or less — of plastic in a zigzag, honeycomb, or regular pattern of lines). Even with a single 0.5mm perimeter and a 25 percent infill level, a 3D-printed part can be very strong. Decorative models often use an infill level of 5 percent or are printed as hollow, with 0 percent infill material. 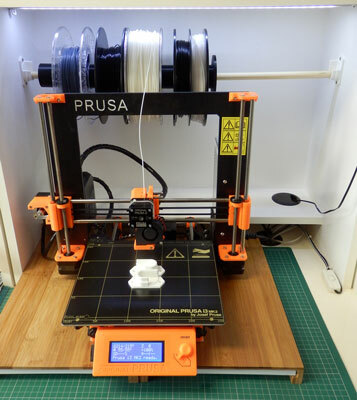 3D-printed parts used for building RepRap 3D printers are often printed with approximately 30 percent of infill. Some parts for high-torque gears and motor mounts require 50 percent to 60 percent infill. You rarely need to 3D-print a 100 percent (solid) infilled object, which uses a lot of material and can take a long time to print. For the example spool mount, a 75 percent infill level is selected. The part is quite small, and it needs to be strong, with more material-to-material contact on each layer. For a functional mount or bracket on a larger scale, you might print with around 50 percent infill; almost everything else would be 25 percent or less. The finished mounting brackets, wooden dowel, and filament spools fitted and in use.